Quito, officially San Francisco de Quito, is the capital city of Ecuador in northwestern South America. It is located in northern Ecuador in the Guayllabamba river basin, on the eastern slopes of the Pichincha, an active stratovolcano in the Andes mountains. 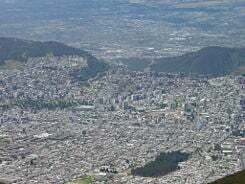 With an estimated total district population of about 2.1 million people as of 2007, Quito is the second most populous city in Ecuador, after Guayaquil. It is also the seat of the Quito Metropolitan District, home to 1.8 million residents, and the capital of the Pichincha province. As the headquarters of the newly-formed Union of South American Nations, Quito is also the de facto capital of South American integration. Quito's origins date to the first millennium when the Quitu tribe (from the Quechua civilization) occupied the area and eventually formed a commercial center. 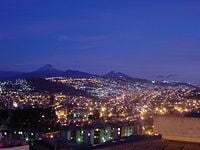 During this pre-Hispanic period, the name of the city was Reino de Quito. The Quitu were conquered by the Caras tribe, who founded the Kingdom of Quito about 980 C.E. The Incas controlled the area from 1450 until early in the sixteenth century. After Huayna Capac's death in 1526 the empire was divided between his two sons, each with a specific area of control. Huascar was given Cuzco and Atahualpa ruled Quito. However the division weakened the Inca infrastructure and stronghold resulting in an inter-kingdom war. This conflict between brothers and the kingdoms they ruled contributed to their eventual defeat at the hands of the Spanish invaders. Francisco Pizarro came to the continent in 1532 with his sights set on conquering the once mighty Inca Kingdom. Atahualpa was ultimately sentenced to death under Spanish law (though his "crime" of polygamy was Inca custom) on August 29, 1533: the end of the mighty Incas. What remained of the Inca city was soon burned to the ground. Although the facts are uncertain, one tradition holds that the remaining Inca refused to let anyone occupy their once glorious city. Another tradition holds that Rumiñahuy, an indigenous warrior, set the city on fire and destroyed the temples of the Incas. Indigenous resistance to the Spanish conquest continued during 1534, with Francisco Pizarro founding San Francisco de Quito on August 15 of that same year. On December 6, 1534 the city was officially founded by 204 settlers led by Sebastián de Benalcázar, who captured Rumiñahui and effectively ended any organized resistance. Rumiñahui was then executed on January 10, 1535. On March 14, 1541, Quito was declared a city, and on February 14, 1556, was given the title Muy Noble y Muy Leal Ciudad de San Francisco de Quito ("Very Noble and Loyal City of San Francisco of Quito"). In 1563, Quito became the seat of a royal audiencia (administrative district) of Spain and was named the Real Audiencia de Quito. 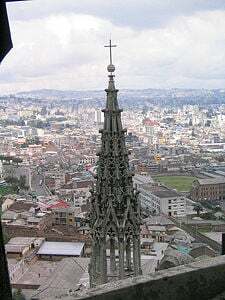 The Spanish promptly established the Catholic religion in Quito, with the first church (El Belén) (Bethlehem) built even before the city had been officially founded. In January of 1535, the San Francisco Convent was constructed, the first of about 20 churches and convents built during the colonial period. The Spanish actively evangelized to the indigenous people, but they also used them as slave labor for construction, especially in the early colonial years. The Diocese of Quito was established in 1545 and was elevated to the Archdiocese of Quito in 1849. In 1809, after nearly 300 years of Spanish colonization, a movement was started in Quito that aimed for political independence from Spain. A plan for government was established that placed Juan Pío Montúfar as president and various prominent figures in other positions of government. However, this initial movement was ultimately defeated on August 2, 1810, when Spanish forces arrived from Lima, Peru, and killed the leaders of the uprising along with about 200 inhabitants of the city. A chain of conflicts concluded on May 24, 1822 when Antonio José de Sucre, under the command of Simón Bolívar, led troops into the Battle of Pichincha. Their victory marked the independence of Quito and the surrounding areas. Just days after the Battle of Pichincha, on May 24, 1822, the leaders of the city proclaimed their independence and allowed the city to be annexed to the Republic of Gran Colombia. Simón Bolívar went to Quito on June 16, 1822 and was present at the signing of the Colombian Constitution on June 24, 1822. Quito has been the scene of demonstrations and political violence since the early years of the republic. In 1833, members of the Society of Free Inhabitants of Quito were assassinated by the government after they conspired against it, and on March 6, 1845, the Marcist Revolution began. Later, in 1875, the country's president, Gabriel García Moreno, was assassinated in Quito. Two years later, in 1877, archbishop José Ignacio Checa y Barba was killed by poisoning. In 1882, insurgents arose against the regime of dictator Ignacio de Veintemilla, however this did not end the violence that was occurring throughout the country. On July 9, 1883, the liberal commander Eloy Alfaro participated in the Battle of Guayaquil, and later, after more conflict, became the president of Ecuador on September 4, 1895. Upon completing his second term in 1911, he moved to Europe, but upon his return to Ecuador in 1912 and attempted return to power, he was arrested on January 28, 1912, thrown into prison, and assassinated by a mob that had stormed the prison. His body was dragged through the streets of Quito to a city park, where it was burned. In 1932, the Four Days' War broke out, a civil war that followed the election of Neptalí Bonifaz and the subsequent realization that he carried a Peruvian passport. Workers at a major textile factory went on strike in 1934, and similar unrest continues to the present day. On February 12, 1949, a realistic radio broadcast of H. G. Wells' novel The War of the Worlds led to citywide panic and the deaths of six people who died in fires set by mobs. In recent years, Quito has been the focal point of large demonstrations that led to the ousting of presidents Abdalá Bucaram (February 5, 1997), Jamil Mahuad (January 21, 2000) and Lucio Gutiérrez (April 20, 2005). Cotopaxi with snow in Summer. Quito lies at 00’ 15” South and 78' 35” West at an average altitude of 9,350 feet (2,850 meters) making it the second highest capital city in the world. There is some confusion about this claim because La Paz, Bolivia, which is higher, is the governmental capital of Bolivia (where the Bolivian government functions). 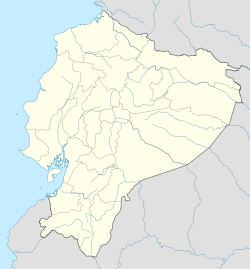 However, Sucre, which is lower, is the legal capital of Bolivia. Quito is located just 15 miles (25 km) south of the equator. A monument and museum marking the general location of the equator is known locally as La Mitad del mundo (the middle of the world). The city lies on a horizontal strip of land that runs North-South on the lower slopes of the Pichincha volcano in the hollow of a gently sloping, fertile valley. In the background are the volcanoes Cotopaxi, Pasochoa and Rumiñahui. View from the northeastern side of the Pichincha volcano. Quito is in the northern Sierra of Ecuador in the Guayllabamba River basin high in the Andes. The entire country, which is roughly the size of the U.S. state of Colorado, contains 19 volcanoes, and the eastern part of the basin in which Quito lies is surrounded by eight of them: Cotopaxi, Antisana, Sincholagua and Cayambe (volcano) to the east; Illiniza, Atacazo, Pichincha and Pululahua to the west. Of particular interest is Cayambe, which is situated east-northeast of Quito. Although it hasn't erupted since 1786, it is the only mountain or volcano on earth that lies directly on the equator and has a permanent snowcap and glaciers. Quito is the only capital in the world to be directly menaced by an active volcano. Guagua Pichincha, only 13 miles (21 km) west, has continuing activity and is under constant monitoring. The largest eruption occurred in 1660 resulting in 10 inches (25 cm) of ash covering the city. The latest eruption was recorded on October 5 and 7, 1999, when a large amount of ash was deposited on the city. Although not devastating, the eruption caused significant disruption of activities, including closing of the international airport. Activity in other nearby volcanoes also can affect the city. In November 2002, after an eruption in the volcano Reventador, the city was showered with ash for several days with greater accumulation than the 1999 eruption of Guagua Pichincha. The region also is vulnerable to earthquakes. Severe earthquakes have plagued Quito for centuries, with significantly destructive earthquakes occurring nearly every hundred years including 1660, 1797, 1868, and one in 1987 which was less severe. The worst known earthquake to hit Quito occurred in 1797 and killed 40,000 people. The most recent major seismic event, with a magnitude of 7 on the Richter scale, occurred in 1987 with an epicenter about 50 miles (80 km) from the city. It killed an estimated 1,000 people near the epicenter, but Quito itself suffered only minor damage. On October 16, 2006, the city felt a quake measuring 4.1 on the Richter scale, but no major damage was reported. Due to its high altitude and proximity to the equator, Quito has a constant, mild to cool climate year 'round. The typical high temperature at noon is 77ºF (25°C) and the typical night-time low is 43°F (6º C). The average temperature is 64ºF (15° C). Quito also experiences minimal variation in daylight hours during the course of a year because of its proximity to the equator. Except for a few minutes resulting from a slight wobble in the earth as it rotates, sunrise and sunset are always at 6:00 a.m. and 6:00 p.m., respectively. Street of the old town (Centro Histórico) at night (García Moreno street). 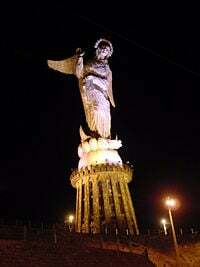 'La Virgen del Panecillo', located on the top of the Panecillo hill, at night. Quito is the capital, and therefore the seat of government, of the Republic of Ecuador and of the province of Pichincha. Quito is the federal capital of the Republic of Ecuador, with its current constitution dating from 1998. The president serves as the head of state and head of government and appoints members of the cabinet. The president and vice president are elected to four-year terms by popular vote and are not eligible to serve consecutive terms. Members of the Chamber of Representatives, or National Congress, are elected by popular vote to four-year terms, with legislative power vested in the unicameral Chamber of Representatives. Governors are appointed by the president to administer each of Ecuador's 22 provinces. Quito is the capital of Pichincha province. Provinces are then further sub-divided into cantones or cantons that are governed by a mayor. These canton mayors are elected by local vote and have become particularly important for initiating local infrastructure projects and environmental controls. Cantons are in turn divided into parroquias or parishes. As of the October 2004 political elections, Quito was divided into 19 urban parishes. These parishes are not the same as the municipal parishes, whose boundaries are determined by the municipality of Quito instead of electoral organizations. Tourism is also an important part of Quito’s economy and has one of the best preserved colonial sectors in South America. 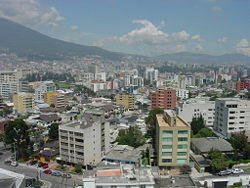 Ecuador's El Instituto Nacional de Estadística y Censos (INEC) 2001 census calculated Quito's population at 1,865,541 residing in 555,928 households. Quito's illiteracy rate was estimated at 4.3 percent with an average monthly income of $387. The official language of Ecuador is Spanish. Several other native languages including Quichua and Shuara are also widely spoken. English is also studied as a second language by many Quiteños. The original ethnic population that once inhabited Quito has blended into the larger society through intermarriage. The intermarriage between Indians, Spaniards and blacks in Quito has resulted in mestizos, who make up nearly 80 percent of the present population of Quito, and in a smaller percentage "mulattoes," "cholos" and blacks. Education in Quito is free and compulsory for children between the ages of 6 to 14. Beginning in the 1980s, public education was greatly expanded in Ecuador to promote the goals of universal literacy and increased tertiary education. As many public institutions are overcrowded, religious and nondenominational private schools play a significant role in education in Quito. Noted for its research programs in fields such as botany, archaeology, linguistics, and anthropology, the Pontifical Catholic University is Quito’s premier university. The National Polytechnic School in Quito specializes in engineering and industrial science and has an outstanding center for monitoring and studying volcanic and earthquake hazards. Other universities specialize in particular areas of study, although the university system in general has suffered from political turmoil and uncertain funding. The Panamerican Center for Geographical Studies and Research at the Military Geographical Institute in Quito conducts geographic and environmental research as well as housing other environmental institutes, libraries, and laboratories. A local unit of the Latin American Faculty of Social Sciences in Quito is one of many social science institutes. Ecuavoli being played in the market. The church procession on Good Friday. View from the Basilica bell tower. The city has many appealing plazas (the Independence Plaza being the most important) and manierist and baroque churches, including: the Cathedral, the convent and church of St. Francis, which is the largest building of the Colonial era built by the Spaniards in South America; the church of El Sagrario; the convent and church of Santo Domingo; and the church of the Society of Jesus, or "La Compañía," which was built after the model of the Church of the Gesu in Rome. Quito boasts a varied and exciting selection of museums and cultural centers. The city hosts the National Symphony Orchestra of Ecuador that performs at the Sucre Theater. Opera, ballet and concerts are held at the recently restored nineteenth-century Teatro Sucre. There are also several museums, many dedicated to Colonial art and history. The most renowned are the City Museum ("Museo de la Ciudad"), the Metropolitan Cultural Center and the museum of the Convent of Saint Francis. The Guayasamín Museum (formerly Guayasamín's home) today houses the museum of his personal collection of archaeological pieces from Pre-Columbian and Colonial times as well as an exhibition of Guayasamín's own work. Cero Latitud (Zero Latitude) film festival held every year in late October. Fiestas de Quito - the celebration of Quito’s founding by the Spanish on December 6, 1534. During the celebration, the streets of Quito overflow with musicians, dancers, actors, color, vibrancy and excitement. The squares and public spaces will play host to a huge variety of shows. The Fiesta de Quito includes the Jesús del Gran Poder Bullfighting Fair, which brings world-class bull fighters and bulls to Quito’s Plaza de Toros bullring. 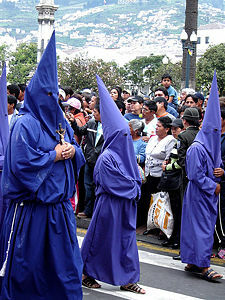 Easter Week (usually in April) with massive processions of penitents throughout Quito's Old Town. As with the rest of Ecuador, Quito is overwhelmingly Roman Catholic and as such, the Roman Catholic Church plays an important role in education, social services and even daily life. Quito has been a center of Protestant activity and Protestantism continues to grow rapidly, particularly among the disadvantaged with the non-Pentecostal Evangelicals and the Pentecostals the largest groups. Mormons have also formed a sizable congregation in Quito and a small Jewish population is concentrated in the city. Quito’s El Comercio (“Commerce”), is perhaps the country's most prestigious newspaper and provides detailed, serious coverage of political, economic, environmental, and cultural news, while Hoy (“Today”), also published in Quito, uses a more modern format. Other newspapers also express a wide range of viewpoints and generally there is no censorship, however the government forbids debate about the validity of Ecuador's territorial claims. One of the oldest and most powerful radio transmitters in the Andes, La Voz de los Andes (“The Voice of the Andes”), provides a diverse range of programming for the local radio stations that includes everything from international rock music to local pasillos, Latin American rhythms, Quechua-language programs, and news. Soap operas, game shows, and imported programs, including special coverage from the United States, Venezuela, Mexico, Argentina, and elsewhere are broadcast by the local television stations. The most popular sport in Ecuador, as in most South American countries, is football (soccer). Quito’s professional football teams include, Liga Deportiva Universitaria, Sociedad Deportivo Quito, Club Deportivo Universidad Católica del Ecuador, Sociedad Deportiva Aucas, and Club Deportivo El Nacional (the Ecuadorian Armed Forces team) from Quito. 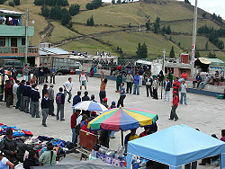 In addition to football, a local form of volleyball, "Ecuavoli," is also popular. The ecuavoli ball is heavier, the net is higher than in traditional volleyball, there are only three players per team, and the rules are more flexible. Bullfighting, a legacy of Spanish colonization, is held annually at a large festival in Quito, but it is not popular nation-wide. The inhabitants of Quito celebrate its Foundation Day in December with a grand celebration lasting for days, called Las fiestas de Quito. The high point of the fiestas is the Corrida de Toros, in which internationally renowned bull fighters are invited to demonstrate their prowess. Northern Quito as seen from the Telefériqo (Aerial tramway) Station at Cruz Loma at about 13,284 ft; 4,000 m.
Only a small portion of the national budget is devoted to public health, and although additional funding is received through deductions from employee’s wages, health conditions are generally poor. Typhoid fever, malaria, amebic dysentery, and tuberculosis continue to exist in Quito and surrounding areas. Domestic and international flights are handled by the Mariscal Sucre International Airport in the northern part of the city, although a new airport is being built in Tababela parish, to the east. ↑ Go Ecuador. General Info Retrieved October 24, 2007. ↑ The Museum of Hoaxes. The War of the Worlds Retrieved November 3, 2007. ↑ The Weather Channel. Monthly Averages for Quito, Ecuador Retrieved November 3, 2007. ↑ Columbia Encyclopedia. Quito Retrieved October 24, 2007. ↑ Ecuador.com Education Retrieved October 24, 207. ↑ United Nations Educational, Scientific and Cultural Organization. City of Quito Retrieved October 27, 2007. ↑ Sitio Oficial Corporacion Metropolitana de Turismo. 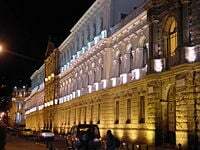 Quito, City of Light: Art and Culture Spanish language tourism site. Retrieved October 27, 2007. ↑ Quito’s Tourism Official Site. Leyendas Spanish language site. Retrieved October 27, 2007. ↑ U.S. Library of Congress - Country studies. Ecuador Retrieved October 24, 2007. ↑ Ecuador Explorer. Orientation Retrieved October 24, 2007. ↑ Quito’s Tourism Official Site. Trains Retrieved October 27th, 2007. ↑ Innovar.uio Metrobus] Spanish language site. Retrieved October 27, 2007. ↑ Exploring Ecuador. TeleferiQo Retrieved October 27, 2007. The National Institute of Statistic and Eduador Censuses. National Plan & Strategy for Statistical Development Retrieved November 10, 2007. Spanish language. Encyclopædia Britannica. 2007. Ecuador Encyclopædia Britannica Online. Retrieved November 9, 2007. The Best of Ecuador. The Inca Empire & Spanish Colonialism Retrieved November 3, 2007. World Facts. Quito Retrieved October 23, 2007. All links retrieved October 11, 2016. This page was last modified on 11 October 2016, at 19:09.